What planet are the contractors on? 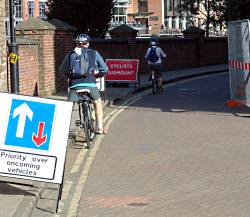 These roadworks (right) happen to be right outside the Hub, York’s friendly bike-recycling place. The signs give priority for traffic going away from the camera up the narrow half of the street left available. 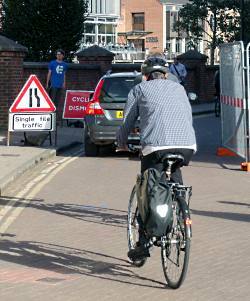 But another sign tells cyclists to dismount – even though motorbikes and cars are evidently fine to proceed. Most cyclists, I’m happy to say, ignore the ‘Dismount’ instruction (which I’m assured has no legal status) and ride assertively but cautiously straight up the middle, as they have every right to do. Some, though, get caught in two minds (top picture), not sure whether to dismount and push along the pavement (which isn’t wide enough for a pushing cyclist to pass a ped coming the other way in any case) or to sidle up the extreme left-hand side, which encourages oncoming vehicles to try and pass dangerously rather than give way as they should. Of course, the smart cyclist (bottom picture) rides in behind a car, using it as a force-field. The contractors would no doubt say they have safety in mind, but the effect – as we know from our experience here – is that it persuades some drivers that cyclists ‘shouldn’t be on the road’. This is an opinion they are so happy to share with us, they will even break off from their mobile phone call to do so. Instead of 'Cyclists Dismount', the sign should say 'Cyclists Proceed (but watch out for bad drivers)'. And as well as 'Give way to oncoming traffic', the sign at the other end of the roadworks should add 'including cyclists'. In theory. But then, in theory, it's possible to land a robot the size of a Mini on Mars, and we all know that could never happen. Unless that's the planet that the contractors are on. nice post. really inspired me to keep cycling for a healthy life and reduce pollution.